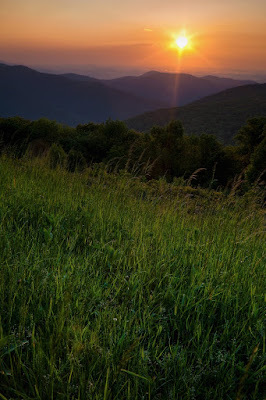 This past weekend we went hiking in Shenandoah National Park for my wife's birthday and this inspired me to finally get around to posting some pictures from a trip I took to Shenandoah on May 30th. As I drove out from Falls Church I knew the sunrise could be promising because all the little valleys on the way to the park were filled with a low lying fog. I was hopeful that I might be able to get some shots of the mountains poking out from a sea of fog and that the fog would also help provide some separation between distant and near mountain ridges. I wasn't disappointed. I entered the park at the Thornton Gap entrance and drove down (and up...) to the Thorofare Mt. 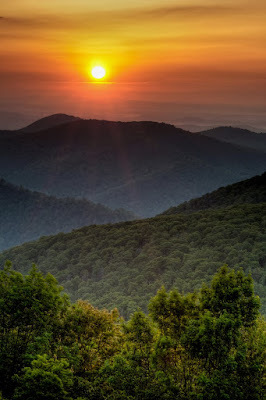 Overlook along Skyline Drive. I bracketed almost all my exposures (+/- 2 EV) for potential HDR processing as I shot the sunrise. I ended up liking the results of the HDR (using Photomatix Pro) for many of my exposures. 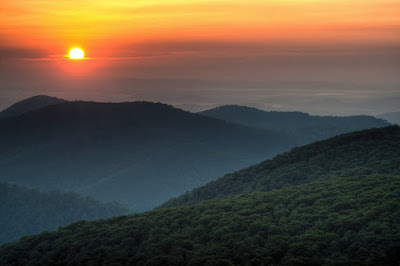 It allowed me to keep the detail in the tree covered hills and foreground vegetation and in the misty orange sunrise. 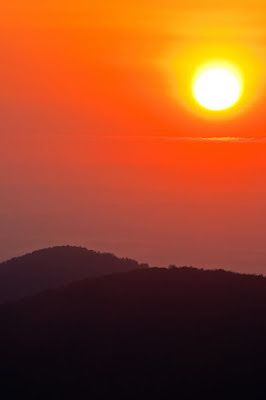 Here are three HDR photos and one normal photo from the sunrise shoot. After it began to get light and the colors of sunrise began to fade, I jumped back into my car and drove down to Big Meadow in the hopes of photographing some white-tailed deer. 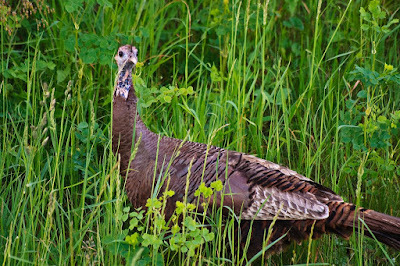 One the way I ran into two wild turkey hens in the middle of the road by one of the west facing overlooks. Unfortunately, there wasn't yet enough light to get a sharp exposure handheld from the car and this is the best photo I got as they moved onto the hillside next to the road. I also ran into several groups of deer, but again there just wasn't enough light to handhold my slow telephoto from the car. Once I got to Big Meadow there were deer everywhere. 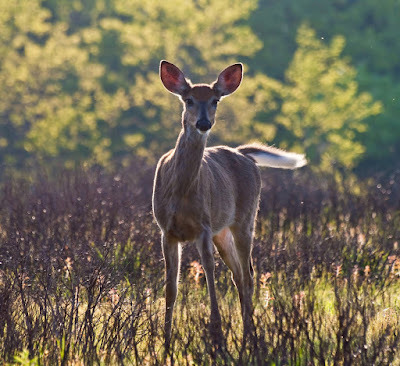 As a general rule the deer in Shenandoah are habituated to the presence of lots of humans and are not hunted in the park, so they are easily approached by car and even on foot. 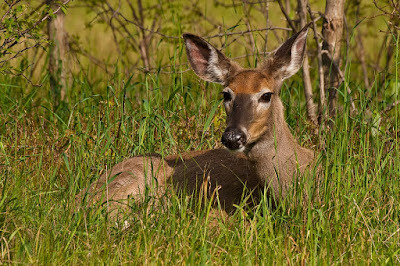 I followed the game trails (and a few other photographers out early) onto the meadow and almost immediately came across this doe settling down to eat and rest. She barely even looked at me as I approached and certainly didn't bother to get up or stop reaching for nearby grass. 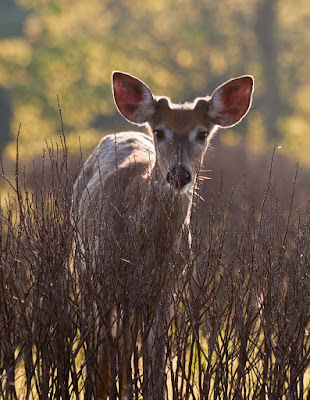 After photographing that doe, I followed my game trail towards a slight up slope towards the woods at the north side of the meadow and two yearling white-taileds (a doe and a buck) actually ran towards me a little ways and then cautiously approached me to check me out. 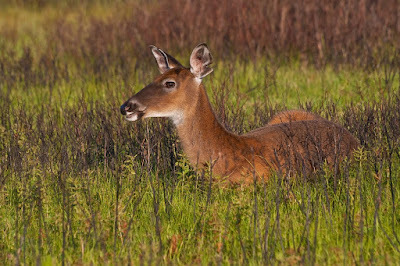 The year old bucks are often called "button bucks" because of the two little "buttons" on their heads where the antler bases are. At this time of year the adult does drive off the young from the previous year to take care of the new fawns and the yearlings will often form small groups of bucks and does or sometimes mixed groups and this seemed to hold true throughout the park(although these were in very close proximity to several adult does using the meadow). 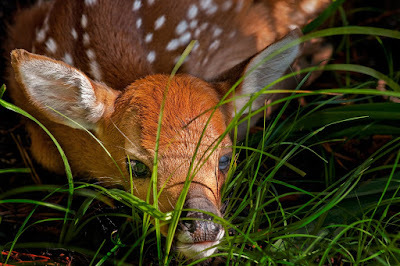 I knew that at this time of year (especially with all the does out on the meadow) there was the potential for finding a fawn curled up in the grass or under a tree or bush where its mom has told it to hide. Fawns rely on their camouflage and lack of scent to hide from predators and will usually stay put even when you are right on top of them. So, I spent a lot of time skirting the edges of the meadow and the woods looking for fawns. As I was poking around the northeast side of the meadow I found this gorgeous swampy area with some flowers and dragonflies. I should mention there were lots of birds out this morning singing, including many warblers. In this swampy area I had particularly satisfying looks at a Canada warbler. Heading back up towards the main meadow I came upon this box turtle. 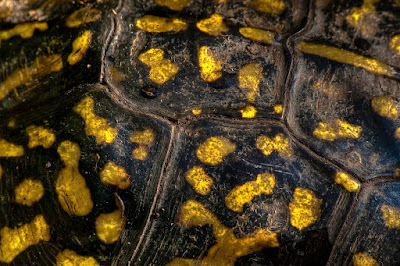 By this time the light was horrible and very contrasty and he pulled his head in when he saw me coming, so I tried out some HDR macrophotography of the beautiful patterning on his/her shell. Again, using brackted exposures and Photomatix allowed me to eliminate the glaring highlights while still maintaining detail in the ridges and the curve of the shell that fell in the shade. Once back on the meadow, I headed towards the north side of the meadow near the woods where I had seen the yearlings (along with many other deer) earlier that morning. Upon checking out a little grouping of young trees, I found this doe bedded down for the afternoon. I should note that for whatever reason, most of the tourists head out towards the middle and the southern side of the meadow, so this northern side was relatively quiet and peaceful. After leaving that doe and making my way across the north end of the meadow back towards my car, I was lucky enough to stumble upon what I had spent the morning looking for. 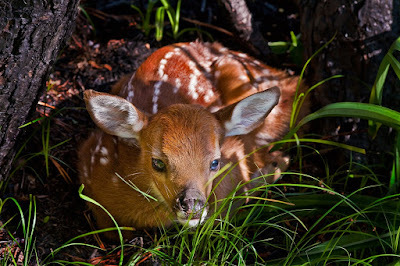 A really young fawn hiding curled up under some trees. Eventually it realized I was not a threat and got curious enough to stick its head out. Of course by this time, the contrasty dappled light was absolutely horrible. Of course the fawns choose that dappled light to blend in with the patterning on their backs. I tried bracketing the exposures and experimenting with HDR, but the fawn just moved too much between exposures for the HDR to work well. So, I spent quite a bit of time with the exposure adjustments in Lightroom and burning and dodging in Photoshop to try to tame the shadows and highlights. Of course, a flash would have helped a lot here (it's on my wish list), but I think in the end the results are not too shabby and reflect what my eye could see (digital and film cameras can't "see" and integrate the same exposure range that our eyes can). 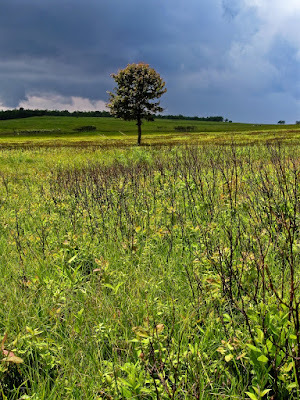 I want to leave off with a scenic of Big Meadow that my six year old daughter took with her camera on my wife's birthday. She asked for the camera for Christmas and has been out with me on photo trips many times (usually not very productive photo trips for Daddy, but fun anyways). Anyways, I think it is a pretty good shot, especially with a Point and Shoot around noon and I promised her I would put it on the blog. Eli I think your daughter is going to be some strong competition for you. The shot she took is AWESOME even if it was done with an ordinary point and shoot camera. There is something to be said for natural talent!